Carter Gill in Commedia dell'Artichoke. Photo by Jacob J. Goldberg. BOTTOM LINE: Bring your friends but not your kids to this naughty comedy with music. At an independent pizza shop in the East Village—I mean the Gene Frankel Theatre—there is an old story being told about chasing the American Dream and the value of hard work. 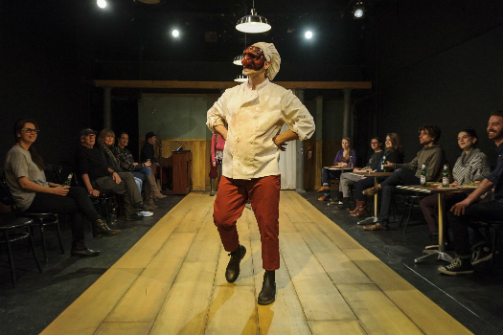 The spiritual successor of 2009's Even Maybe Tammy, by Frances Black Projects, Commedia dell’Artichoke is the culmination of seven years and three other shows in which the company explored the world of Commedia dell’arte, improving their craft as they revisit old characters and themes. Pulcinella, a struggling pizza chef, finds himself in a bind when his landlord attempts to force him out of his store, but he is not one to give up easily. Through music, jokes, and slapstick comedy, he and his employees deal with the problems of running a small business and the cast of characters who come through the restaurant. Commedia dell’Artichoke is told in the style of Commedia dell’arte, a form of masked theatre originating in 16th century Italy. It features stock characters, raunchy physical comedy, and not entirely politically correct jabs at current events in the world. Commedia, by nature, walks the line between humor and offense, creating a type of show you’re unlikely to experience elsewhere. The four actors onstage embody this spirit wonderfully, playing a total of ten characters who all exhibit delightfully grotesque mannerisms. Due to this shameless quality of these performances, I recommend you come to this show with an open mind, prepared to have some sensibilities shaken. All that said, if you’re in the mood for some bawdy laughs at the expense of others, Commedia dell’Artichoke is the show for you. The writing is fun and flowing, showing the potential of intensely collaborative projects like this one. You’d never know just from seeing it that parts of each performance are actually improvised. The seamless inclusion of improvisation throughout scripted scenes is a testament to the actors’ investment in the piece, and makes for a unique show every night. As an audience member, it is always pleasurable to see a production with pieces that mesh as well together as these. This cohesion is only amplified by the skillful design of the room. The Gene Frankel Theater, an incredibly versatile performance space, is transformed here into a pizzeria, the centerpiece of which is a thrust stage. While they can’t fit a whole pizza oven in the theatre, the chairs and tables on either side of the room really help to create the playing space. The actors also get a lot of support from their colorful, distinctive costumes and the active, but not overstated, lighting. Commedia dell’Artichoke makes the most of its resources in its transfer from its 2015 run at Artichoke Basille’s Pizza & Bar, and it absolutely pays off for them. Commedia Dell’Artichoke is conceived by Frances Black, Carter Gill and Tommy Russell and directed by Devin Brain. It is produced by Frances Black Projects in association with CAP21. Original Music is by Robert Cowie and the company. Choereography is by Frank Ventura. Set design is by Catherine Akiko Day. Lighting design is by Marie Yokoyama. Costume design is by Lisa Loen. Masks are by Emilia Buescher, Den, Jordan Allen-Dutton and Mister Face. The cast includes Carter Gill, Alexandra Henrikson, Tommy Russell and Shannon Marie Sullivan.